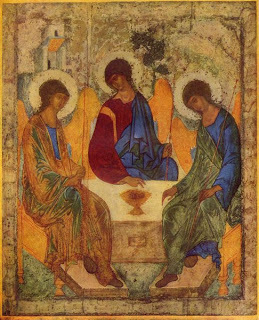 I said in my last post that one of the problems in talking about the Trinity is that sometimes the metaphors we use lean towards threeness and sometimes lean toward oneness. This post will lean toward the threeness end. When we see the Trinity as loving community and fellowship we also see one of the fundamental parts of the image of God in humans. God created us for community. We image God when we live together in loving peaceful community. Is the doctrine of the Trinity practical? I mean by this does the doctrine have implications that should, (indeed must) affect the way Christians live? Ware asks these questions at the beginning of his article: “What practical difference does the threefoldness of the one God make to us most of the time? Can we say in all sincerity that it has a drastic affect on our understanding of human personhood, of society and politics?”2 I suggest that if the doctrine of the Trinity is nothing but philosophical speculation it is meaningless and should be abandoned. But the doctrine does have practical effects. In a later blog I will talk about the effects of the doctrine on salvation. Here I will focus on the implications of God as community imaged in humans, creating the human community. If imaging the Triune God means being in loving community with all other humans, as I suggest that it does, then how we treat other human beings is vital. As we look at another human being we should see not just a person but the image of God. We should see a partner in the human community. Notice I do not say that this community is limited to the Church. Since all humans are created in the image of God, no matter how damaged and broken that image may be through sin, all humans still are created in God’s image and therefore part of the human community. 2. Listening. If the other in the conversation is the image of God then how we listen and with what focus we listen becomes vital. John quoted St. Francis in an earlier blog to the effect that it is out duty to know the other more than to be known. Truly hearing others is a vital part of imaging God. This provides some (but not all) theological background for me in the work that John and I are doing. Hearing those with whom I agree or disagree is a vital part of imaging the God who is the triune God in relationship. 3. The scandal of poverty. If all humans are created in the image of God we who are rich deny that the image of God exists in those who are poor. That malaria continues to kill children every single day when remedies are available for pennies is a scandal. It is a scandal that a large portion of humanity lives so far below the poverty line that they are in danger of starvation when a remedy could be made at little cost to those of us who are rich (rich means if you have a computer and are reading this you are rich. If you had enough food today and have enough for tomorrow you are rich. If you have shelter and more than one set of clothes, you are rich). 4. Religious war. I am happy to say that most Christians around the world today have learned that conversion by threat of death is sinful. But the hatred of Muslims in the West and people who look like Muslims (what does a Muslim look like anyway?) must end. Certainly there has to be caution and care taken to prevent terrorism and much terrorism perpetrated today is done in the name of Allah. But fearing those who kneel and pray in an airport because it proves they are Muslims is foolish. Terrorists usually try to blend in, not stand out. Interfaith dialogue must continue. The list of human sins against other humans is tragically long. If the persons of the Trinity exist in an eternal fellowship of love and if at least part of the image of God in humans is to reflect that love, then how we treat each other is vitally important. The Triune God is, from one perspective, a loving fellowship. May we so image God that we are the same. “The Trinity: Heart of Our Life,” Kallistos Ware, in Reclaiming the Great Tradition: Evangelicals, Catholics, & Orthodox in Dialogue, Jams S. Cutsinger, ed., (Downers Grove, IL, Intervarsity Press: 1997), p. 136.